Wow! What a week! Bishop, California is a fantastic place to call base camp for the Eastern Sierras. 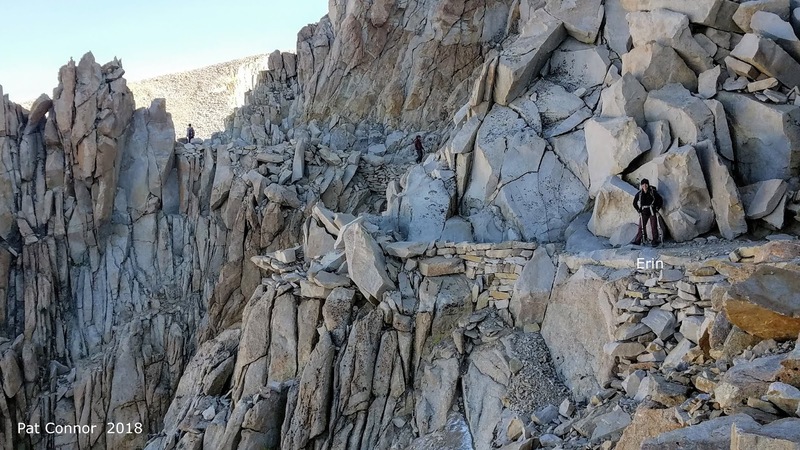 A large group of around twenty-five club members found plenty of hiking to do below the peaks of the Palisade Crest and other 12,000 to 14,000 foot snow patched granite mountains. We hiked among the gorgeous alpine lakes and beside the rushing canyon creeks. And, on a practical note, there was very little residual smoke from the bevy of huge California fires. What little smoke there was laid in Owens Valley below our hiking arena. With three hike coordinators, we managed to cover the bases on hikes from high moderate to very strenuous. On Monday, we caravanned from Las Vegas to the Schulman Grove of the Ancient Bristlecone Forest where fourteen hikers stretched their legs on the 4.25 mile Methuselah Loop. This also served to help acclimate us to the 10,000' elevation level. The next day, only three of the expected seven hikers went out for the hike up White Mountain, easiest 14ner around. (Understandably, great excuses from the other four.) The three hikers made the peak in very cold and blustery weather. On the way down the twenty mile dirt and windy road from the trailhead, they experienced golf ball sized hail. Very long drive! The other hikes of the week escaped the rain and had great temperatures. Kay's (moi) hike on Tuesday was Little Lakes Valley Trail to Gem Lakes and Chickenfoot Lake. Gem Lakes were the "gem" but Chickenfoot Lake can be ignored next time! My hike on Wednesday took us up the magical Bishop Pass Trail. Nine of the fourteen hikers made it all the way to Saddlerock Lake (11,004'). The other five stayed back with Lettie for a little R&R. 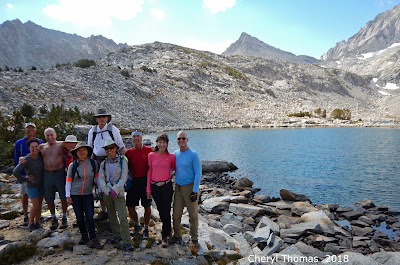 Thursday's "ladies" hike went back to Little Lakes Valley where we took a spur trail up toward Mono Pass but stopped at Ruby Lake, a beautiful amphitheater type lake. The backdrop included Mt. Mills, Mt. Abbott and Mt. Dade. We could also see David's group of hikers climbing the switchbacks up to Mono Pass way up above us. 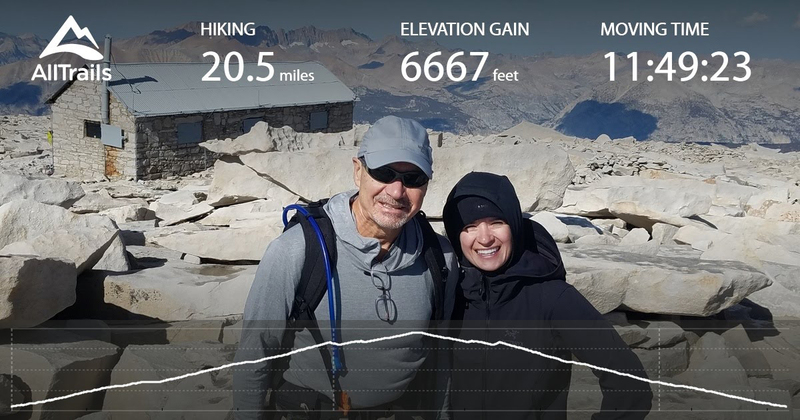 David led a long hike up to Blue, Donkey and Baboon Lakes above Lake Sabrina on Tuesday. Reports were that even though it was quite long, the views of the lakes were amazing. Worth the climb! Also, signs for Baboon Lakes have recently been erected making the navigation more manageable. 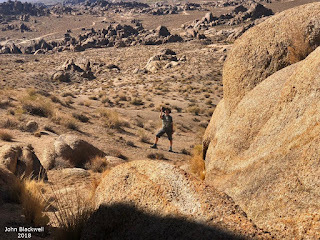 Wednesday, the other hike took Jerry's strenuous group up a scramble to Treasure Lakes found out of Little Lakes Valley. After a very strenuous Tuesday, all were very happy with this easier hike with quick reward! Wednesday night, most of us ate at Perry's Italian Cafe where we enjoyed ourselves immensely! Most of the group, for many different reasons, left Friday. And, then there were nine! On Monday and Tuesday, we had club hikers on Mt. Whitney. Tim Whiffen and two friends had hiked over from Sequoia NP on the High Sierra Trail to finish at Whitney Portal on Monday. Then, on Tuesday, Pat Connor and Erin Connor (Mike's brother and niece by a different brother) hiked the mountain in an excellent time of 13 hours. WOW! We enjoyed hearing their storys for the next few days. Then, on Friday, four of the remaining hikers tackled Piute Pass, an 11 mile adventure. I, for one, was very glad I did not miss it! 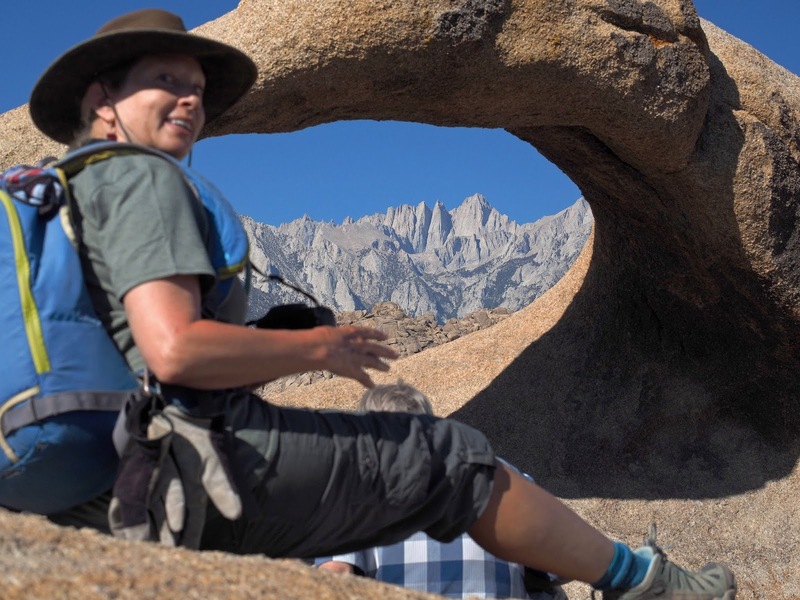 Piute Pass is a challenge because of the many steps built into the trail throughout the hike. It became a joke at one point! "More steps!" Regardless, we made it up and back in good time and the views were amazing. 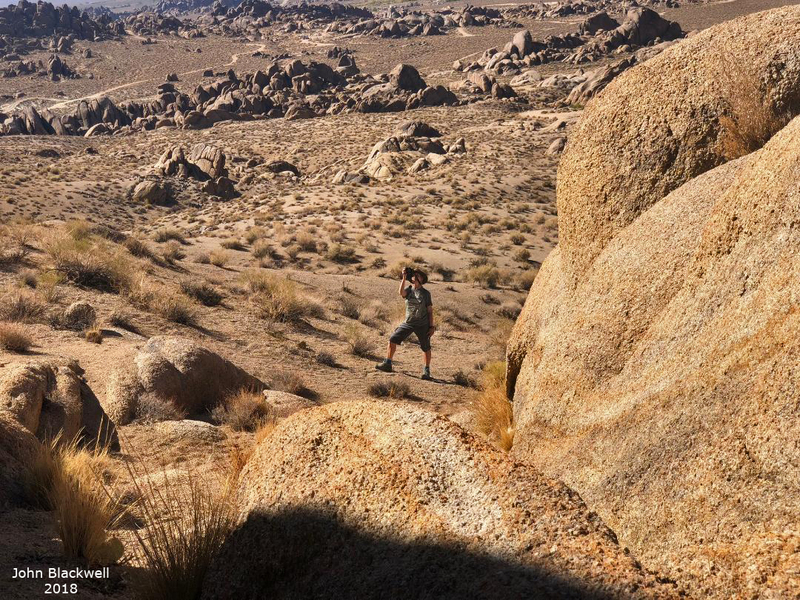 On the last day, seven of the remaining hikers drove south to Lone Pine and the Alabama Hills. We did the short Arch Loop and added a small climb up to the Eye of Alabama Arch. 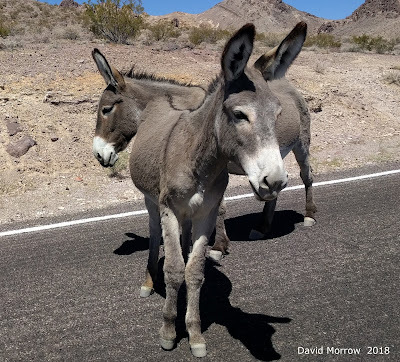 From there, five of us stopped in Stovepipe Wells in Death Valley NP for lunch (in 120 degree temperatures) and drove the rest of the way home. Thanks to all for contributing to such a wonderful week! 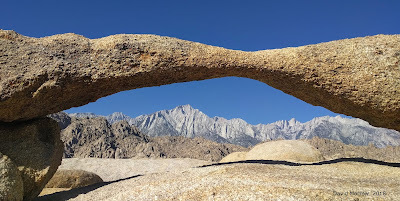 Following this entry, I will post blogs for Gem Lakes, Saddlerock Lake, Ruby Lake, Piute Pass and Alabama Hills. Not sure where David found these! Beatty?